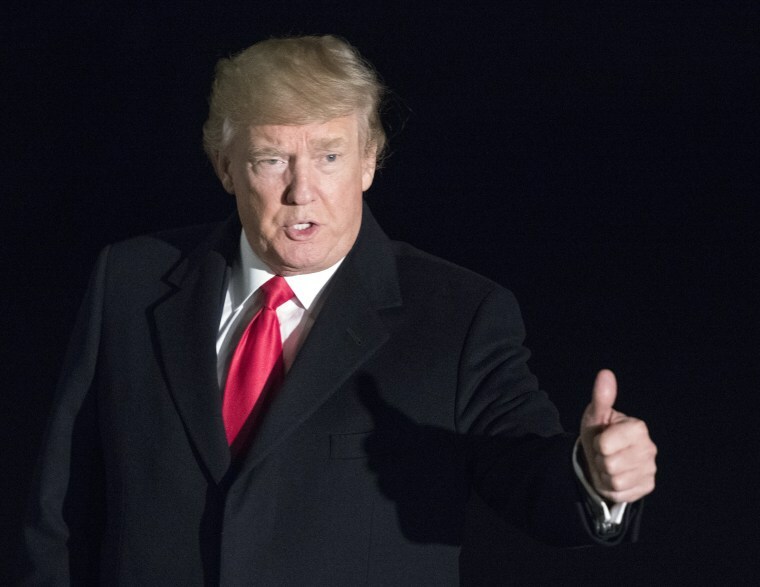 WASHINGTON — President Donald Trump stressed the need for "unity" Tuesday afternoon, hours before delivering a State of the Union address that White House officials have previewed as "bright and optimistic." "I want to see our country united," Trump told network news correspondents during a traditional, and otherwise off-the-record, lunch at the White House where he made the case that the same national divisions encountered by his administration had plagued his predecessors as well. The United States "was divided, not just under President Obama or President Bush. I remember the impeachment of Bill Clinton. Tremendous divisiveness, not just over the past year," he said, adding that he would consider uniting the country "a tremendous success." "I would love to be able to bring back our country in a great form of unity, without a major event — very tough to do. I would like to do it without a major event, because that major event is usually a bad thing. Unity is really what I'm striving for, to bring the country together," he said. Aside from the traditional correspondent lunch, Trump spent Tuesday much as he'd spent the previous day: making impromptu changes to his first official State of the Union address as he practiced the speech, which is slated to include bipartisan overtures on big items like immigration, Press Secretary Sarah Huckabee Sanders said Tuesday. The president did several "dry runs" of the speech Monday afternoon in the Map Room of the White House, said a White House official, who told NBC that Trump's handwritten notes and edits on each draft have been transcribed into its more current versions. The process of writing and re-writing the address began in December, this official said, with a "pretty meaningful" edit on the plane ride to Davos, Switzerland, last week. "He's been going through the speech meticulously," Deputy Press Secretary Hogan Gidley told Fox News on Tuesday afternoon, describing Trump as using a "black felt-tipped pen" to edit the remarks before sending it back to staff, and calling him a "master messenger." However, "the speech begins and ends with POTUS," the same official told NBC, looking to stress Trump's level of involvement in his remarks. The address will cover "a lot of territory," Trump himself told reporters Monday as he finished swearing in his new Health and Human Services secretary, Alex Azar. The president said he would tout the "great success" of the stock market and the tax cuts passed at the close of the year, but will also make a push on immigration policies, including DACA. "For many years," Trump said, lawmakers have "been talking about immigration" but "never get anything done." Now, with him at the helm, he said he's hopeful for action that unites Democrats and Republicans. "We’re going to get something done, we hope bipartisan," Trump said, noting that the reality in Congress for Republicans makes bipartisanship an essential factor, not a wishful one. "The Republicans really don’t have the votes to get it done in any other way. So it has to be bipartisan." The White House released its immigration plan last week, in a bid to re-start stalled negotiations on the topic. Counselor to the president Kellyanne Conway said Monday the president's actions and negotiations on this topic were a sign of his "openness" to getting a deal done — especially for "Dreamers" who were brought to the U.S. as children and protected from deportation under an Obama-era policy, DACA. Bipartisanship, she said in an interview with The Washington Post on Monday afternoon, is "the only way to function in this town," but she knocked Democrats for a strategy she described as "obstruct, resist, hold up a stop sign" to Trump. Despite her own jabs across the aisle, Conway promised a State of the Union address that's "positive in tone and content" and one in which Trump will be "forward looking" — seeking the nexus between his accomplishments over the past year and how those achievements have bettered the lives of Americans. To support the president's push for his agenda on issues such as immigration and border security are guests like Elizabeth Alvarado, Robert Mickens, Evelyn Rodriguez, and Freddy Cuevas: parents who lost daughters to violence from the gang MS-13. Veterans who have battled ISIS, law enforcement officers on the front lines of the opioid crisis, and American workers who benefit from Trump's tax cuts will also be seated with first lady Melania Trump for the address. And though senior administration officials previewed what they called an "optimistic speech," it won't be without the brand of tough talk that helped propel Trump to the office in the first place. Noting once again his belief that "the world has taken advantage of us on trade for many years," Trump promised Monday that his administration would bring any unfair practices to an end. But Tuesday's speech will be light on specifics as to how that might be accomplished, senior administration officials told reporters over the weekend. The speech, the officials said, would touch on the "broad themes of U.S. engagement in the world" — encompassing trade and global economic systems in the remarks, but not getting into specifics or naming names of countries that Trump feels are abusing their trade relationship with the United States. The state of the union is always 'strong.' But why? More than anything, the White House has indicated that the president's remarks will likely seek to strike a tone of command and stability against the backdrop of a political system that has been reeling since his arrival one year ago. Trump's address will come as investigations into his campaign's contacts with Russia remain ongoing, and a three-day government shutdown is still only barely in the administration's rear-view mirror. "I hope you enjoy it," Trump said of his speech.